Presidential election—GOP set, Democrats doing what they do. Says it’s clear where it will end, but debate is shifting now that Trump is saying he loves women. Says our enemies want Trump and will fight hard for him. Speaks of anger against Trump and of how it’s important we participate in political process. Asks when facts should actually matter in a debate. Hopes election will prove the ridiculousness of some of the political rhetoric of the country. Says cable networks tell us when candidates go to bathroom. Says people now believe us when we say people are trying to privatize public education. Speaks of public education cuts, defund, discredit and dismantle. Says education won’t get better and reformies will say teachers need to do more with less, public schools are failing, and that they will then offer to save us cheaper and better. Says this is less likely in NY and they will fight elsewhere where it’s easier. Says half of states are getting cuts, and some states are getting pension cuts. Says you need to speak back to people who say states can’t afford pensions. Was local governments who decided not to pay, but teachers paid their shares. Says politicians hate paying into pension funds and this will be a big issue. NY Assembly passed a 3-year mayoral control bill, no changes. Waiting on Senate, UFT does not support current version of mayoral control. Refers to NY Post editorial saying mayoral control ought not to mean total control, and says it contradicts what they said when Bloomberg was in power. Says NY Post are hypocrites, say what they say at any given moment. Says someone can tweet that out. Lederman—court ruled that they can only overturn her evaluation and not system because system has already been changed. Says we used the case to get appeal process in place. Says as we move forward, this has to be part of our discussion, and that we must have appeal measures in place in case someone is being harmed when they should not be. This shows we need safeguards in place, we told them at that time those on top and bottom were not valid. Very happy she won. We like the multiple measures. Do we want principal completely in charge, he asks. Yes, I hear. Elia—alternate assessment—says 18 districts used a new evaluation system, and that for this year it is a pilot that does not need to be used for teacher evaluation. They may pull it out and substitute something this year. Says if IEP says child cannot use a test, you cannot use a test. Says US DOE will grant up to 7 waivers for states to use project based learning instead of standardized tests. We should be one of those states. We’re concerned that Elia says now she doesn’t think she should do it, because no money tied to it. Whether there’s money or not we should push it. Says he loves the idea of state developing project based learning. Says he told us governor said he wanted to be our friend, he said his mother was teacher, and he’s upset teachers are unhappy. Says we as teachers should modify behavior. Says we don’t like merit pay, but if he wants to recognize teachers that’s fine. For PD, national board certification it’s fine. Governor trying to make his mom speak nicely to him because all teachers hate him. When kid who drives you nuts does one nice thing what do you do? Thanks everyone at Spring Conference. Was SRO, sold out. Mental wellness particularly overbooked. Asks if mindfulness is new politically correct term. Says it was nice with Elia and Rosa. City council budget will move fast. Says they want to be done by June. Says city has great budget and we had a lot to do with it. Says NYC teachers lobbied hard for money, want it at schools, not central. Says when principal says they have no money, they will have money. Asks that we take budget class. Says it will be pivotal to our work. Says principals will blame special ed. but they are making money on it. Maybe there are too many APs. Many principals are doing right thing but there are still some who need CL to stand up at SLT and complain about how much is spent on APs. We are focused on teachers’ choice and other things. We need you to meet with council members. We want to talk about positive and collaborative learning, community schools. We supported affordable housing plans. There is one in Brooklyn Navy Yard. Index has moved up and many teachers now qualify. Says it’s being completely renovated and it should be a hot spot of NYC educators. Asks how many of us are doing SBOs. Says we should be careful, that we should approve it, make sure staff has it. We should be talking about entire structure. How are we going to handle evaluation? School week will likely be scheduled the same it is this year. If you want to reconfigure, move forward. Thanks Anne Goldman for Nurses’ Lobby day. Says it was national nurse week. Applause for nurses. Shows posters. Says to post posters about union benefits. Speaks about Verizon, says we want to support our brothers and sisters on strike. Says ballots due to triple A by May 25th, should be mailed by end of week. re-org grievances due within two days of notice. Next and final DA June 15th. Jonathan Halabi—Principal said he had to hold SBO vote. Says he needs it by a certain date. Asks that de B admin show respect, in contrast to Bloomberg. CL—Observations—deadline is coming up, but not everyone has been observed enough. How will it impact numbers? A—We should have evaluation and observation school wide plans run by teachers. We have now 100 master and model teachers. Says teachers training each other how to observe and are doing peer observations. Says then they train admin. Says principals and supes on board. We were hoping for this as we created positions and changed evaluations. Says schools need to know it’s constructive professional process about helping one another. Says teachers are now on two year waiting lists to be master or model teachers. Says there was never a plan in place, that schools should work together and overcome gotcha mentality. SED will take a rating as long as there are two observations. But if admin doesn’t do job, no harm should come to our members. Says we have protected members but as CL it’s important to engage staff and admin in how we use observations to move schools forward. Speaks of school where teachers trained one another in lesson planning. Says if admin has no time we should move process ourselves. Delegate—Had two instances where parents threatened teachers. Says principal told by legal to only give warning letter. Says it would be punishment to transfer kids to other class. A—Asks if DOE legal has right to stop order of protection—lawyer—no—says parents have been banned from buildings. You have a right not to be intimidated or harassed by parents or admin. CL—Is it OK for principal to combine last post of with summative? A—No. Observation meeting about individual observation. Summative is about everything. Q—How can we look at budget and help our special needs students? How do we know how much money is coming to them and fight for it? A—They took the money and put it somewhere else. You need to sign up for budget training. Says beginning of school year is too crazy for CLs—Can we offer it before school starts? CL—I need training. My principal will only show me SLT budget. Has no money, paying for F status AP, interim acting who declined interview, and a behaviorist. A—We will get you training. Put behaviorist in principal’s office. CL—With flex scheduling, and many ICT teachers having ICT and SETS, how can they fulfill obligations with diminished time? A—They can only have flexibility if there is breakage, if position isn’t full, depends on IEP. Says we will come in and help. There should not be multiple teachers on flex. If there is full position should go to regular teacher. P. Egan—recommends endorsement Assemblyman Keith Wright. Says they interviewed multiple candidates for Rangel’s seat. Says he is best. Recommends him. Teacher says he’s done nothing for Harlem community. Says we need someone who speaks to lower and middle income people. CL—speaks in favor, worked with him, says he’s always been there for Harlem schools. Says he stood up for UFT, community, has broad coalition. CL—asks if not him then who. Mulgrew rules this out of order. Motion to call question, second. Resolution to support immigrant students. Oliver Canell—Asks mayor and chancellor to specifically state ICE not be allowed in public schools. Says there are more raids targeting families and children, that they’re nervous about sending kids to schools. Wants it clear that schools are safe places for our students. Says many of us have undocumented students or students with undocumented family members. Wants someone with training to support these students at all schools. Emil P.—Proposes substitute resolution. Two sentences. Much shorter, less explicit. James Vasquez asks what he’s doing. Mulgrew says he will now explain. EP—understand sentiment, but with background info he and Barr did, there are many issues. We have questions about whether or not students had issues in school buildings. Said in LA they barred ICE from schools, but was symbolic. You cannot keep fed agency out of building. Says we’re creating a false expectation for problem that doesn’t exist. Says there is petition attached. Speaks to immigrants that may have committed felonies, and racist punitive policing policies. If we pass as is we would be causing a problem by giving credence to problem that doesn’t exist. Are we debating one against the other? Delegate—Opposes sub resolution. We all know when a student is undocumented they live in constant fear. We need to say they have right to be in school safely. First resolution is about being explicit about what schools are for—education and welcoming families. Says just because issues haven’t happened does not mean it isn’t important we proactively support students when facing harassment and deportation. Mulgrew says union is extremely supportive of immigration. Anthony Harmon speaks in favor of sub resolution. Says we are already helping people with citizenship, we have strong relationship with immigrant communities and partners. Says sub res provides us with more latitude. Delegate—point of order—why not table until next month. CL—Wants to amend substitute motion. Would like to take second resolved from original res. Speaker—agrees and seconds that we should have someone in buildings. Leroy Barr—supports amendment to sub res. Partially against original. Says of course we want children to feel safe. We will continue to work with partners to respect immigrants and make them feel safe. Speaker against substitute amendment calls it subversion of democratic process. Chair disagrees, says we are following rules. Says we are not running for president of US. Speaker says he clearly tried to squash spirit of law. George Altomare—calls question on all matters. Evelyn de Jesus—says how proud she is, is Puerto Rican, says she was an L student. Thanks Janella Hinds and me for bringing resolution. Says there are many languages spoken, Says all educators will be teachers of ELLs at some time. Says changes were well-intended, we warned state that implementation would be difficult. Says prediction came true in many districts and schools. Refers to NY Times article. 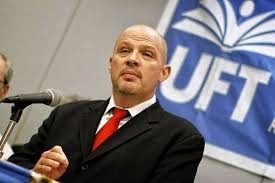 Says UFT will continue to help and advocate for our kids. CL speaks of ESL teacher doing impossible job. Says Part 154 making her job impossible. Anne Goldman—Cameras in our schools—will encourage safety. Mulgrew calls for adjournment, wishes us good Memorial Day Weekend.